January 12th is National Hot Tea Day. 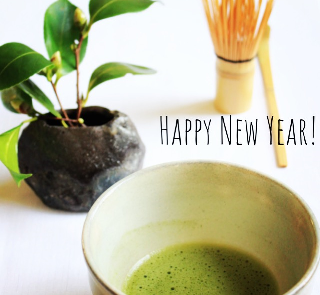 Let’s celebrate with a nice cup of hot green tea. Cheers! 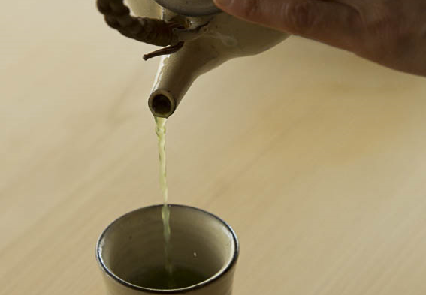 Start a new habit of drinking green tea rather than sweetened drinks. 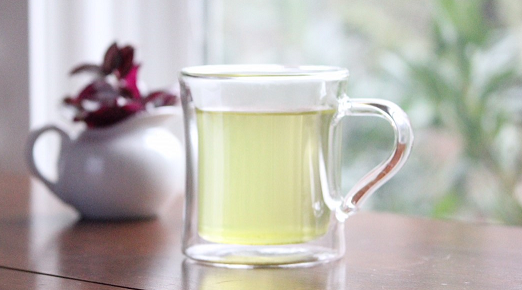 Green tea has lots of health benefits and boosting your metabolism is one of them. It doesn’t happen in one day. Drink tea every day! Take a moment and make some tea. Slowly and carefully. 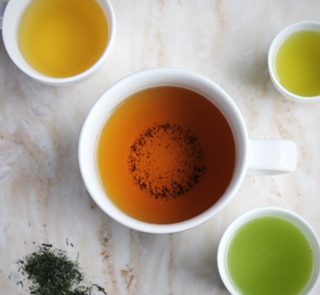 Relax and enjoy the flavorful tea. Happy 2018! 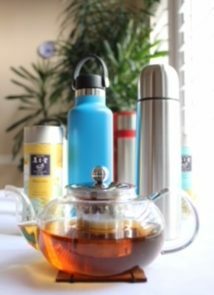 Get a thermos so that you can make tea and bring it with you everywhere you go. Happy 2018! 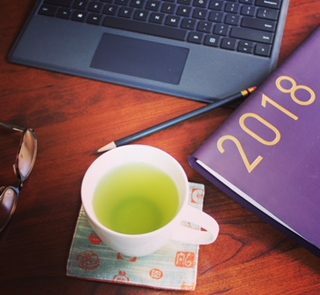 May 2018 be a good year for you all! 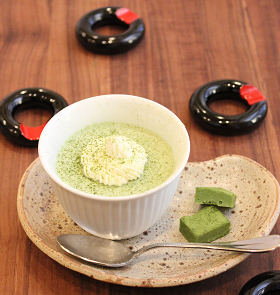 Matcha bowls, or chawan, are beautifully decorated bowls that are used to make matcha. Four seasons play a big role in Japanese culture and matcha bowls are no exception. In summer, you should choose a chawan that looks cool and in winter, a warm looking one. If the bowl has a flower pattern on it, you should be careful when to use it. You should not use a bowl with a flower that is out of season. For example, a bowl with cherry blossoms should not be used in summer or a bowl with fall foliage in spring. Also, you should avoid using it right in the full bloom season. Japanese believe that the flower pattern on the bowl cannot compete the beauty of the real flower. It is always a good idea to use chawan with flowers that are just a bit ahead of season. The same applies to patterns of kimono. There are lots of written/unwritten rules like this in Japanese culture. It can be too much or unreasonable sometimes, but trying to enjoy and understand them is valuable. The rules like these are what make Japanese culture rich, complex and interesting. Mochiko is sweet rice flour. The cake made with mochiko has a unique mochi-like texture. Great fit for gluten intolerant folks. Find the mochiko and red bean paste at Asian grocers. In ancient Japan, the monks and teachers were highly ranked and admired by regular people. Usually, they would be wise, calm and serene. But toward the end of the year, everybody becomes busy. The monks and teachers are no exceptions. So the anciant people in Japan named the last month of the year “shiwasu,” that means even the masters would run. Now we are near the end of shiwasu. Everyone must be busy, running around! Take a moment to make some tea and relax! December 15th is International Tea Day! 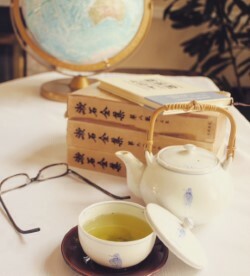 Did you know that 3,000,000,000 tons of tea is produced worldwide each year? And 1,520,000 pounds of tea is consumed in the U.S. every day. (source: Statistic Brain). Let’s have a cup to celebrate the special day!
) Dissolve the gelatin powder in 1½ Tbsp of water and set it aside.
) 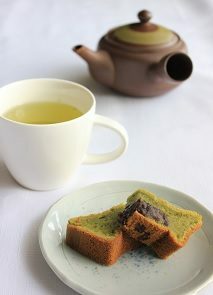 Dissolve matcha in 2 Tbsp boiling water and set aside.
) Heat the milk in a pan and dissolve the 2 Tbsp sugar.
) Dissolve the gelatin in the milk. Add the dissolved matcha to the milk and mix well.
) Whip the heavy cream and set aside.
) Add ½ Tbsp of sugar to the egg white and beat well until stiff peaks form when the beaters are lifted.
) Add the whipped heavy cream and the egg whites to the milk mixture and mix well.
) Pour the mixture into cups or glasses and chill them for 2 hours in the refrigerator. 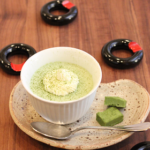 *Decorate with whipped cream and matcha powder (both extra).